Explore St. Michaels' things to do, whether you're traveling here for a weekend retreat or a business trip. Our charming coastal town on the shores of the Bay and River offers a wide range of exciting attractions that will appeal to dozens of interests and tastes. Whether you prefer hunting antiques or hunting waterfowl, there's something for everyone in St. Michaels, Maryland. 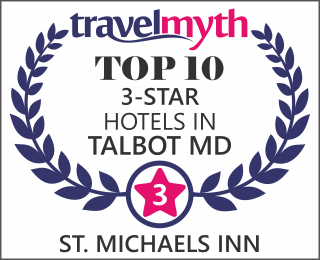 If you have any questions about local attractions, the St. Michaels Inn staff is more than happy to offer recommendations on local attractions, dining and more. Below are a few of our favorite things to explore. When it comes to getting to know St. Michaels, the perfect place to start is the St. Michaels Museum at St. Mary's Square. Learn about the history and culture of our beautiful town on the Green. Then stroll through charming downtown, where you'll find shops, restaurants and other attractions. Located on 18 acres of St. Michaels waterfront, this extraordinary floating fleet museum features interactive exhibits and demonstrations on the Miles River, including boat rides, and celebrates Chesapeake Bay culture and history. Visit Hooper Strait Lighthouse, see a working boatyard, and visit Waterman's Wharf. Leave behind the every day when you arrive in the picturesque, rural scenery of Talbot County. Boasting a rich history as one of the oldest European settlements, it stretches along 600 miles of the Chesapeake Bay, and today is home to restaurants, retailers, museums and historic sites. A true vacation resort retreat, St. Michaels, Maryland boasts several fine, challenging golf courses for weekend warriors to explore. Popular courses close to St. Michaels Inn include Hog Neck Golf of Talbot County, River House Golf at the Easton Club and Harbourtowne Resort on the waterfront. Maryland is world renowned for its excellence in fishing and hunting. Excursion guides and gear outfitters are located near St. Michaels Inn, so you'll have everything you need for an unforgettable sporting experience, whether it's on water or land.You can also hone your skills on one of several shooting ranges. December - Midnight Madness & Christmas in St Michaels.